We are investing in the future by enabling the most academically talented students to receive a top-quality business education. We have £2million+ of WBS Scholarships 2016 for the most talented applicants for 2016 entry to the MBA and MSc postgraduate courses. 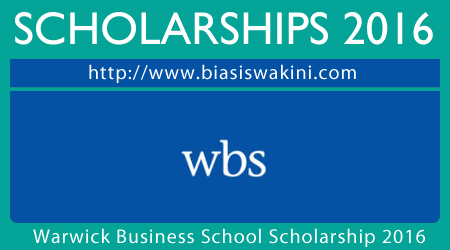 WBS Scholarships 2016 are available to the most talented candidates from all over the world. You will automatically be considered for a WBS Scholarship upon submitting your course application. There is no deadline for applications, but we advise you to apply as soon as possible. You can also apply for a WBS Scholarship when you apply to our Doctoral Programme at here. The deadline for scholarship applications for 2016 entry is 18 March 2016. 0 Komentar untuk "Warwich Business School Scholarship 2016"